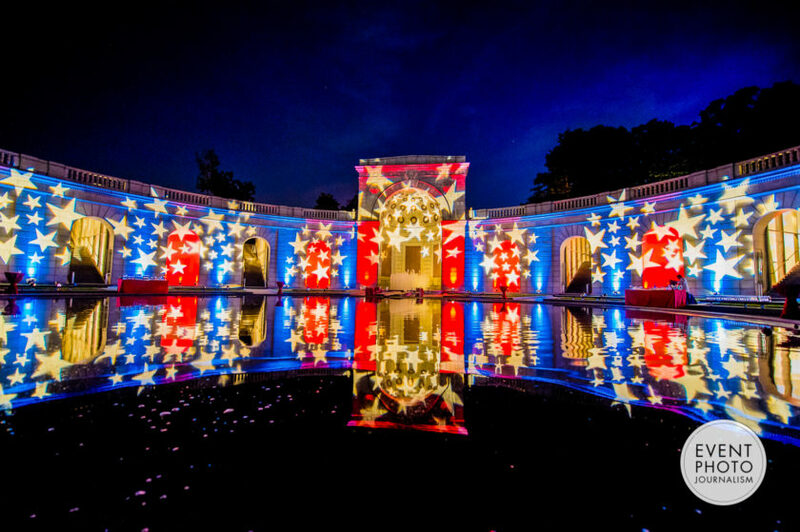 In the Nation’s Capital, it’s hard to go wrong with a patriotic-inspired special event. We are surrounded by monuments and memorials that are both breathtaking and historically significant. When done right, the Red, White & Blue theme just feels right and makes for amazing event photography in Washington DC. Clark Construction’s annual Officers’ Party held at the Women In Military Service For America Memorial was one of those patriotic events. With impeccably designed tablescapes from Edge Flowers and first-class cuisine and service from Susan Gage Caterers, guests took in the beauty of the DC event venue with an outdoor cocktail party on the upper and lower terraces followed by a seated dinner indoors in the Memorial Education Center. When the sun set behind Arlington National Cemetery, the true magic of the evening came out to greet the guests for their dessert reception and departure. Red and blue uplighting and bold star gobos made for impressive and dramatic lighting on the arched façade of the Women’s Memorial Hemicycle wall. The effect was doubled with the memorial’s reflection in the reflecting pool. Red, White & Blue…done right. About the Women In Military Service For America Memorial: The Women’s Memorial is a unique, living memorial honoring all military women—past, present and future—and is the only major national memorial honoring women who have served in our nation’s defense during all eras and in all services. It’s the only major national memorial honoring all servicewomen—past, present and future. The Women In Military Service For America Memorial honors the some 2.5 million women who have served or are serving in or with the US Armed Forces starting with the American Revolution. The 4.2 acre Ceremonial Entrance to Arlington National Cemetery is open to the public every day except Christmas. Dedicated October 18, 1997. Groundbreaking held June 22, 1995.
Credit: Women In Military Service For America Memorial Foundation, Inc. Event photography at the Women In Military Service For America Memorial for Clark Construction‘s Officers’ Party by Event Photojournalism. Special event photography in Washington DC.